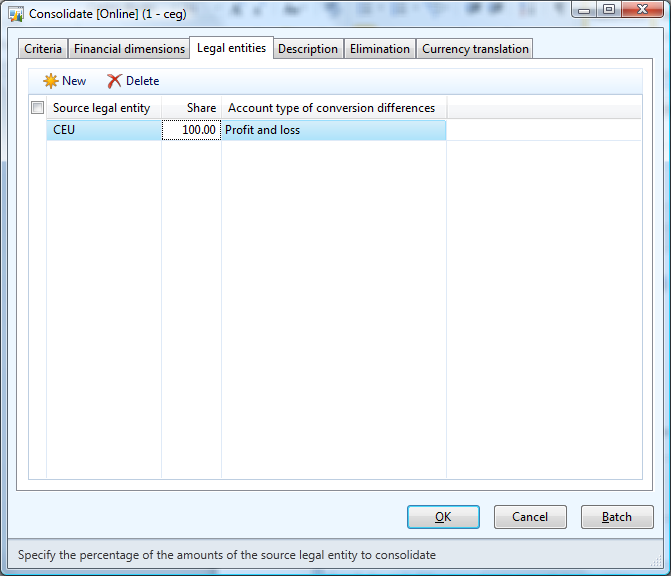 To start the scenario, I created a cash receipt in the subsidiary company CEU (source company). CEU operates in USD as the accounting currency. Below is the journal entry that was created for the cash receipt and we’ll work with this transaction through the consolidation process and subsequent foreign currency revaluations. The Cash receipt is dated 10/11/2012 for USD 500.00. – The accounting currency for the consolidation company is EUR. I created an exchange rate type called Consolidation to use for this company. The following exchange rate exists for the period starting 10/01/2012, which will be used for the exchange rate calculation during the consolidation process for the entry in CEU based on the transaction date of 10/11/2012. 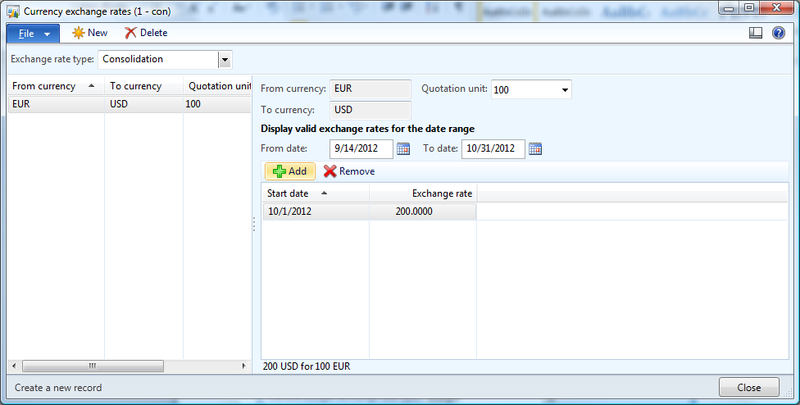 I am using an exchange rate of 200.00 for simplicity in explaining the calculations. 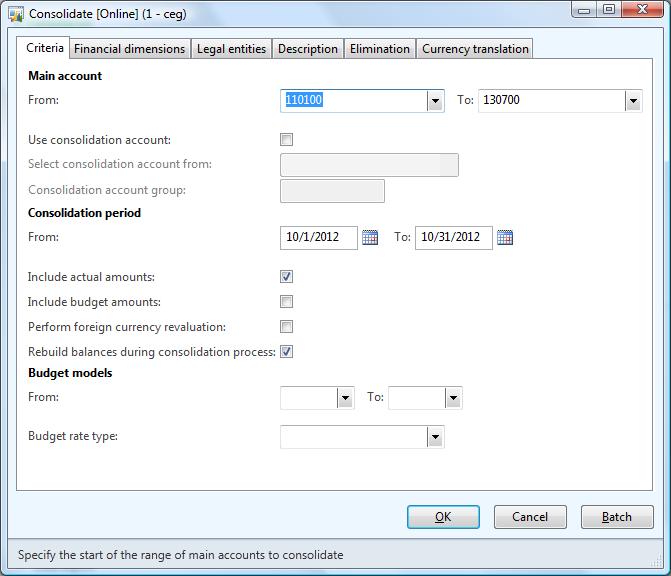 Now perform the Consolidation using the consolidation online process. 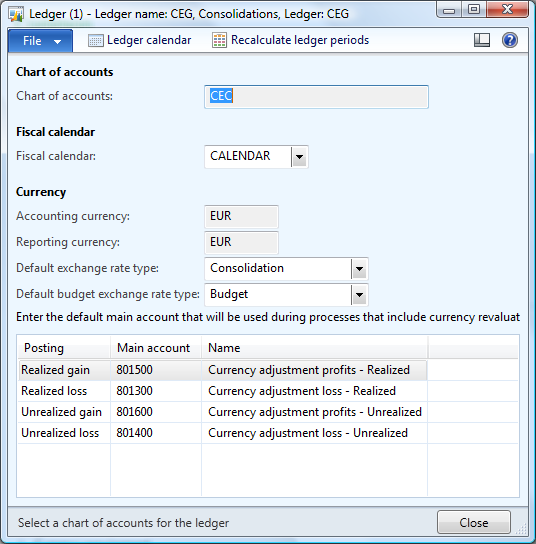 (General ledger | Periodic | Consolidate | Consolidate (Online)) For illustration purposes, select the range of accounts that encompasses both the Cash and A/R accounts used on the original cash receipt journal from the subsidiary CEU company. 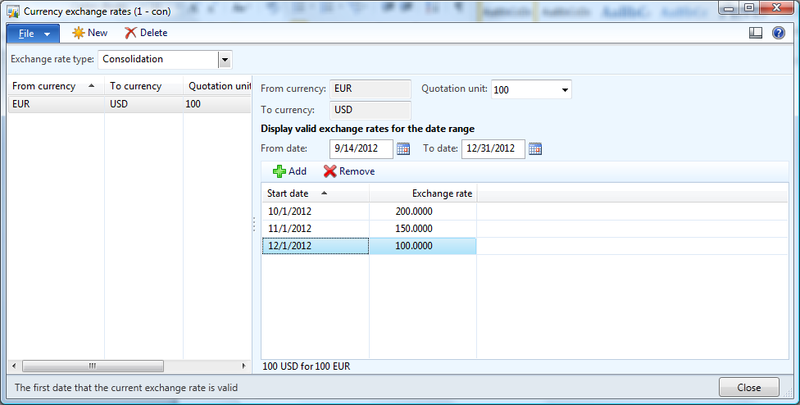 – Date range covers the date of the cash receipt entry. – Marking ‘Rebuild balances during the posting process’ during consolidation will update the financial dimension sets used for reporting purposes in the consolidation company. – I did not include financial dimensions in this illustration. However, you can use the financial dimensions tab to select the dimensions that you want to include in the consolidation process. I have selected the source company CEU for 100.00. 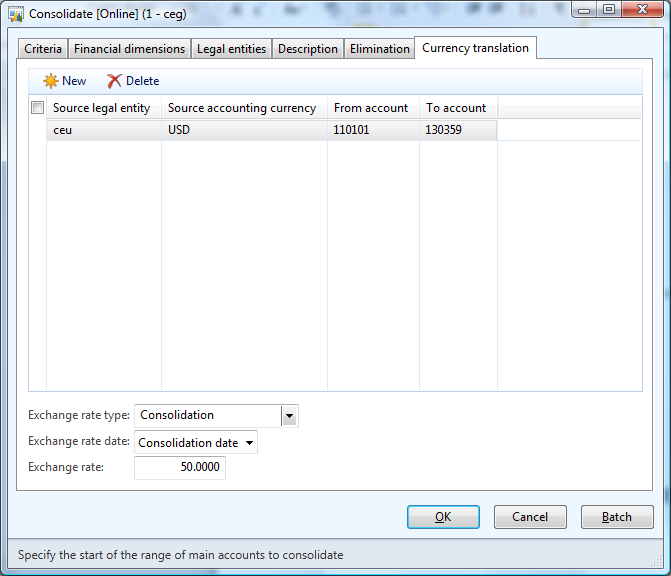 – Again I included a range of accounts that would cover the Cash and A/R accounts. – Select the rate type to use for consolidations and you will see the exchange rate to be applied, which in this case is 50% based on the previously defined exchange rate of 200 USD = 100 EUR. 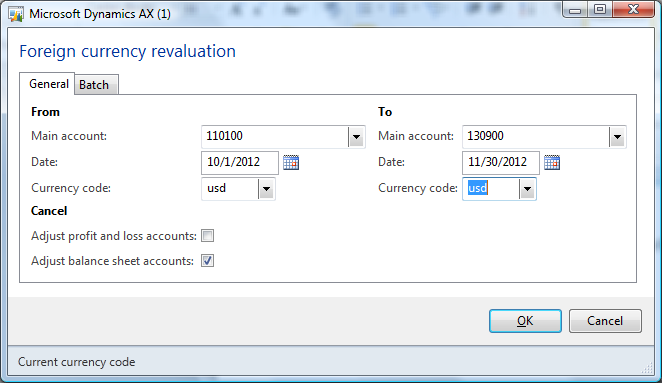 Next a foreign currency revaluation will be performed in the Consolidation company. 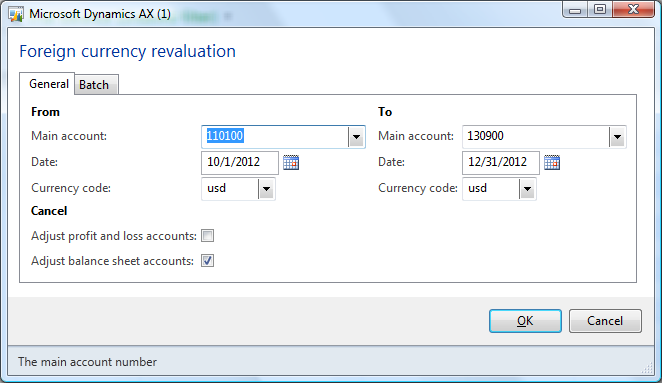 However, first, ensure that the accounts that you want revalued have the ‘Foreign currency revaluation’ option marked in the Main accounts form. * The new balance for the cash account is 333.33 EUR and the amount that is posted as exchange adjustment is the delta betwen the original EUR amount and the revalued amount: (250.00 – 333.33) = 83.33 that is posted. Now modify the exchange rate again for 12/01/2012. I updated the exchange rate to be 100.00. As a result of this, after the foreign currency revaluation, the balance of the cash account should be 500.00 = to the original amount of the transaction in USD. When you view the Trial Balance list page, you can see that the amounts have been adjusted to 500.00 and the appropriate gain/loss is recorded. 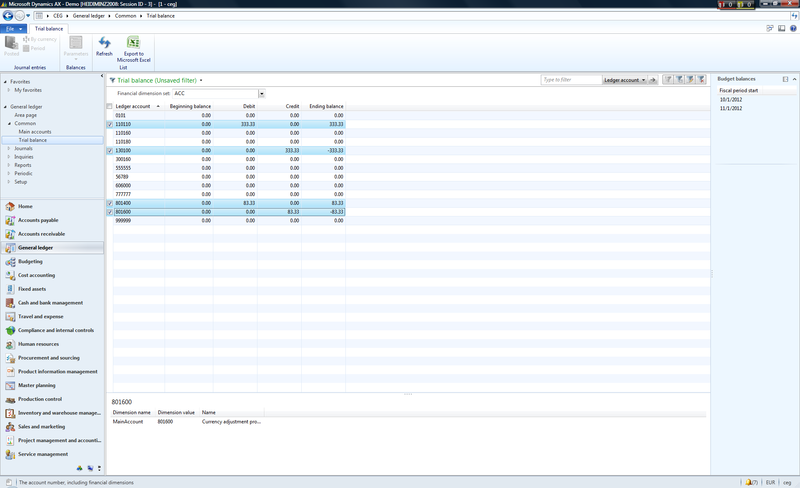 500 * .6667% = 333.33 (from prior revaluation). 500 * 100% = 500. (333.33 – 500.00) = 166.67 that is posted. So this demonstrates that the foreign currency revaluation in the consolidation company does not completely reverse and treat the entire amount as an exchange adjustment if these appropriate steps are followed.